Coming from wealthy stock, cousins Kate Codd (Maria Aitken) and Daisy Troop (Jill Bennett) have experienced less luck when it comes to the currency of romance. Kate has had two previous marriages that have both ended in divorce and she now finds herself 'slumming' it in a basement flat in Manchester with her pet snake Sidney. Luckily for Kate, the theatre loving handyman Dave Roberts (Richard Walker) lives nearby and is happy to undertake various jobs around the flat for her. Daisy, meanwhile, has entered into the institution of marriage three times and, rather unluckily, has been widowed thrice with her latest husband Gerald being trampled to death by a giraffe. Despite not having seen each other for many years, Kate invites Daisy to move into her flat while she finds her feet following Gerald's demise. Both Kate and Daisy are used to being kept women and they dream of meeting another husband to restore this status quo, Kate after all is rather horrified at the prospect of getting a job and Daisy bemoans her loss of first class airline travel. Kate regularly has to contend with her most recent husband Larry (Lewis Flander) still being present in her life, Daisy moves a peculiar set of furniture into the flat from the Far East that prompts a series of visits from stran visitors and Kate's mother Lady Harriet (Joan Hickson) takes a trip to the theatre with a European prince. Poor Little Rich Girls is well acted, but the narratives themselves are a little sitcom-by-numbers and the characters' plights are hardly drenched in relatable empathy. Curiously, despite clearly being a trad sitcom and the characters even appearing to pause for laughs, there's no laughter track. The series was written by Charles Laurence who cashes in with some nice gags and dialogue about upmarket relationships. The actual idea behind Poor Little Rich Girls, however, was apparently devised by Aitken and Bennett who were personal friends. The seven 25-minute episodes were produced by Granada and aired on Thursday evenings on ITV at 9pm. Wayne (Steve Steen) and Donny Armadillo (Jim Sweeney) run The Seal Club, a seedy nightclub down by the docks that often requires the installation of dummies to cultivate a sense of popularity. Despite the lack of punters through the doors, The Seal Club manages to drum up plenty of business in the form of surreal chaos. Fashionista pop star turned performer of the dark arts Steve Devious (Daniel Peacock) celebrates his birthday at the club, but turns up with a vengeance seeking warlock hot on his heels. A washed up soap star from the 1960s finds himself propping up the bar in his new role as a backstreet abortionist who performs a disastrous nose job on the "elastic hip songster" Zipmole Watkins (Daniel Peakcock). And there's also time for Wayne and Donny to attempt an armed robbery at the Bank of Borneo. In amongst the main plotlines, there's also time for numerous spoofs and parodies of contemporary television such as TV-am and It'll Be Alright on the Night. These interstitial sections often pop up on the television set in The Seal Club, but sometimes they help frame the main narrative such as the two security guards (Stephen Frost and Mark Arden) watching the Armadillo brothers' armed robbery on CCTV. Little Armadillos is also keen to keep the variety flowing by introducing musical numbers provided by doo-wop girl group The Flatlettes. Gloriously anarchic, with a healthy dose of surrealism mainlined into its veins, Little Armadillos is curiously forgotten in the annals of British comedy despite featuring Helen Lederer, Phil Nice, Stephen Frost and Mark Arden alongside Steen and Sweeney. Little Armadillos isn't quite as unhinged as The Young Ones, but it shares its DNA for being sidesplittingly funny thanks to its sheer variety of comedy be it spoofs of Gandhi, visual gags featuring bailiff Arthur in a quick succession of disguises or even good old fashioned violence being dished out towards Wayne by Donny. Little Armadillos was written by Pete Richens and Colin Gibson with Richard Fiddy and Mark Wallington pitching in with additional material. The six 25-minute episodes were produced and directed by Bob Spiers who had previously worked on such legendary comedy shows as Dad's Army, The Goodies and Are You Being Served? 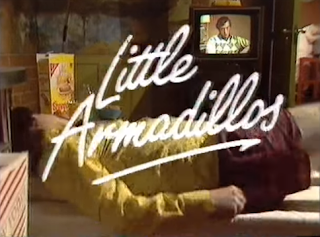 Little Armadillos aired on Thursday evenings in a late time slot of 11.20pm. The series received no repeats and, in conjunction with its late scheduling, explains why it's one of the lesser known comedic gems lurking out there. Better known as the Carmarthen Cowboy, Aubrey Owen (Peter Blake) is a long distance lorry driver who works for Doggy Dins and delivers dog food from Carmarthen to Hull. He's also rather keen on becoming a Mastermind contestant and claims to be irresistible to women. Dogfood Dan, meanwhile, was born Dan Milton and delivers dog food from Hull to Carmarthen on behalf of Bona Fido. His main hobby appears to be supping ale with his mates and he's a self professed amateur when it comes to charming women. Meeting up once a week in a trucker's cafe, Aubrey and Dan muse over trucking, dog food and women. And it's their pursuit of casual, hassle free relationships which will soon become the centrepiece of their weekly chats. Whilst staying overnight in Hull, Aubrey passes himself off as a visiting Labour MP and woos Helen (Elizabeth Mickery) who confesses that, much like Aubrey, she is married. And, whilst he's working in Carmarthen, Dan claims to be a transporter of 'abnormal loads' while romancing Myfanwy (Arbel Jones), who, much like Dan, is also married. Aubrey and Dan regularly discuss their new found loves (and exaggerate the extent of their relationships) during their roadside chats, but little do they know that they're conducting affairs with each other's wife. Episodes of Dogfood Dan and the Carmarthen Cowboy take on a rather formulaic structure, but thankfully they don't descend into a mundane slog. And this is all thanks to David Nobbs' witty and engaging scripts which cleverly look at the inner workings of relationships. The concept, of course, couldn't have been sustained much further, but Dogfood Dan is an entertaining watch which never outstays its welcome and is bolstered by a cast which do it justice. Dogfood Dan started off life as a one-off production in the ITV Playhouse series back in 1982 which was written by David Nobbs, but featured a completely different cast. Eventually airing as a six episode series, Dogfood Dan went out on BBC2 in a 9pm slot on Thursdays and was not granted any repeat airings..The series was produced and directed by Alan J.W. Bell who is best known for directing Last of the Summer Wine and The Hitchhiker's Guide to the Galaxy. Commis chef Victoria (Julia Watson) and nutritionist-turned-waitress Dawn (Natalie Ogle) not only work together at fine dining eatery Quasimodo's, but also share a flat. Unfortunately, they also share a tendency to catch the attention of Fred Ponsonby, a chef with wandering hands. With life at Quasimodo's pushing them both to their breaking points, Victoria and Dawn decide that it's time to strike out on their own with a catering company that they christen A Touch of Spice. However, the two girls soon find that running A Touch of Spice is far from straightforward. And that's not even taking into account the fact that they have a resident mouse named Godzilla in their kitchen. Each catering job that A Touch of Spice take on seems to become more disastrous the closer they get to serving the starters. Victoria's banking boyfriend Clive (Martin Jacobs) brings them their first client when he needs a lunch at short notice for one of his most important clients, but it turns out this is the vegetarian owner of Quasimodo's. A rather wealthy couple - who are friend's with Victoria's spendaholic mother Helen (Virginia Stride) - request A Touch of Spice's services for a dinner party where Dawn potentially kills the couple's dog. And, whilst catering for a local Darby and Joan club, Dawn decides to gamble what little remains of A Touch of Spice's ailing finances on a hot racing tip from her uncle. The concept behind A Touch of Spice is a little limited and perhaps the characters aren't quite intricate enough to fully engage the audience, but it's far from poor. Julia Watson and Natalie Ogle are both lively leads and each script manages to generate several laughs. One series was probably enough, but if you want a quick half hour of middle class laughs then A Touch of Spice can serve this up with ease. The series was written by Francis Greig with its six 30-minute episodes broadcast on BBC1 on Thursday evenings at 8.30pm. A Touch of Class was not commissioned for a second series and even a repeat airing for the series failed to materialise. That's another edition of British TV Comedies You Can't Remember completed, so as ever, please comment below and let me know if you remember these or if you think they sound a load of old pony. Thanks for the myriad suggestions contributed for future editions. I'll try and get round to investigating them soon. I remember A Touch Of Spice. I enjoyed it but watched it mainly for Julia Watson as I was a huge fan of Casualty at the time and she’d played Baz. Like Karen above I too was a huge fan of early Casualty and loved Julia Watson as Baz, but A Touch of Spice rings no bells with me at all unfortunately. Sounds pretty good. As indeed does Little Armadillos...well, that sounds interesting at least! No Frills which allowed Kathy Staff to step out of Nora Batty's wrinkled stockings and co-starred Belinda Sinclair aka Fran from Shelley and Katharine Schlesinger of Doctor Who: Ghostlight fame. Foreign Bodies, a BBC Northern Ireland sitcom about about a protestant car mechanic who falls in love with a Catholic nurse from Dublin. Streets Apart with James Hazeldine and Amanda Redman as reunited childhood sweethearts on different rungs of the social ladder. Life Without George with Simon Cadell and Carol Royle. It's weird that one has become 'forgotten' as it was quite big at the time, running for 3 series. I remember No Frills. It wasn't bad from what I remember, wouldn't mind seeing it again. Oh and Hope It Rains a rather strange sitcom with Tom Bell and Holly Aird. It didn't really work at the time, though it did run for two series. I imagine if it were made now, in this day and age of dramady, it would play much better. I don't remember any of these, save for 'A Touch of Spice' which I recall from title alone and nothing more. It's interesting to note that, from the classic but rather 'safe' sitcoms of the seventies (and I include the likes of the immortal 'Porridge' within that grouping), many sitcoms did feel to be trying to find their feet in the alternative-comedy world of the 1980s. 'Ever Decreasing Circles' - Okay so I'm starting with one that isn't that much forgotten, but often criminally overlooked, especially when compared to Richard Briar's other major sitcom, the exhaustively repeated 'The Good Life'. As much as I love TGL, I've always ranked ECG as far superior (and some of Briar's best ever work). Although a traditional sit-com in many respects, it also had elements of a tragi-drama and was multi-layered and even dark at times. There was a running question regarding whether patience-of-a-saint wife Ann (the wonderful Penelope Wilton) was actually having an affair with golden-boy neighbour Paul (Peter Egan) or not; this was never even addressed directly on-screen and all the stronger for it. More familiar "comedy neighbours" Howard and Hilda (matching jumpers et al) bought the series back down to a more comfortable sit-com fare. Oddly far less repeated (I think it last had a mainstream outing some 15 years ago as part of BBC One's afternoon schedules) it has a quality (and a cast) that feels it should be one of the Beeb's regular comedy repeats line-up but curiously has never reached that status. If you've never seen it and like vintage comedy, it's well worth a look. 'Filthy, Rich and Catflap' - the "in between" series, between 'The Young Ones' and 'Bottom', starring three of the four Young Ones. Infamously very little repeated, especially regarding terrestrial-wise, and less remembered. I've never seen it (actually I do believe I have an episode or two on an old VHS I inherited years ago now, but can't recall much of the series). Considering the whole 'Young Ones'/'Bottom' connection (both which have considerable status and fanbases) a curiously forgotten entry. 'Wyatt's Watchdogs' - a little remembered Brian Wilde vehicle (although it wasn't originally written for him, I read), that with kid's obscurities 'TTV' and 'Bad Boyes', first brought me to this excellent site with an excellent dedicated article. Made in 1988, during Wilde's then-boycott of sorts from 'Last of the Summer Wine', it saw him helming a neighbourhood watch project. It wasn't great; I remember my parent's watching the first episode and not bothering with the rest, but as a young boy, I quite enjoyed it and recall watching all six episodes of the lone series made. I remember Dogfood Dan. I quite liked it from I can recall. 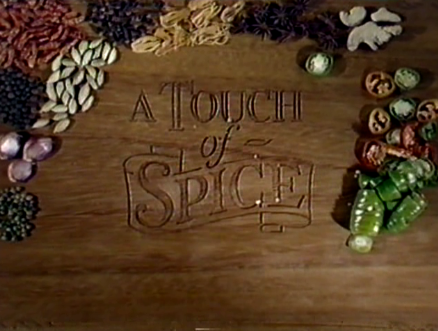 I remember a Touch of Spice being advertised, I also remember letters to points of View about it, though can't remember if they were from fans or detractors. I don't think I ever watched it though. Does anyone remember The Clairvoyant with Roy Kinnear and Sandra Dickinson? It wasn't very good but I loved Roy Kinnear so watched enthusiastically. Finally got round to watching two (half-)forgotten shows from 1993 last week. First, Tony Slattery's 'Just a Gigolo'. Could have blossomed into a classic were it not for his troubles. 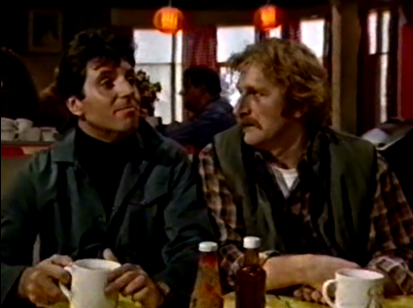 At the very least it shows there was enormous potential for Slattery as a sitcom lead. Then Jack Docherty and Moray Hunter's 'Absolutely' spin-off 'Mr. Don & Mr. George', which is just wonderfully silly. It's on All4 so it probably doesn't qualify as obscure enough. I just don't recall it being mentioned around here before. Something else that's overlooked and really shouldn't be: 'How to be a Little Sod' in which Rik Mayall voices a Baby Behaving Badly, as it were. For my money it has the funniest opening titles in TV history. "WAAAAAAAAAAAAAAAAAAAAAAAAAAAAAAAHHHHHHHHHHHHHHHHHHHHHH!!!!!!" Just a Gigolo sounds like a good one, you can't beat a bit of Slattery!